Owning your own pair of Dr. Martens Safety Boots (Doctor Martens, Doc Martens, Docs or DMs - call them as you will) is being part of the iconic look. DMs are recognised worldwide since they were first invented on April 1st 1960 (indeed that is why the original,best seller is called the 1460 (1st of 4th Month 1960)... With any Dr. Martens footwear you benefit from premium materials with high durability, the distinctive yellow stitching and the famous air-cushioned soles, "AirWair" for maximum comfort. Dr Martens have introduced new styling: So these boots have the same comfort, support and technology, but a radically more modern, sporty look: The Dr Martens Drax Sports hiker safety boot, or the metal-free Dr Martens Falcon which has no metal - handy for security guards; or this Dr Martens Cottama pull on safety dealer boot; and even the sporty shoe/trainer look: The lightweight Dr Martens Gunaldo is as sporty a safety shoe as you will find. How they make Dr Martens: Dr. Martens have an internal stitch, or plain welt. This welt reinforces the strength of the shoe yet again. 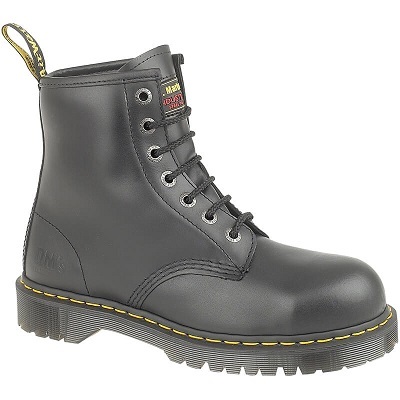 Where you see the external yellow stitch (such as on this Dr Martens safety Waterproof rigger boot), it is housed in a vat of warm wax which makes it supple - but also ensures that any holes made by the needle as it makes its way around the edge of the boot will not allow water into the shoe. The PVC Goodyear Welt:- the strip of PVC that carries the distinctive yellow thread is skillfully stitched by a machinist onto the upper, using the yellow thread and a welt sewing machine. The Dr. Martens air cushion sole itself - as seen on the DM Forge 6637 model - is produced in the factory, using a granular compound which is first melted, then injected into a mould which carries the distinctive DMs sole pattern. After the soles have cooled, a felt strip is inserted into the cavity of the insole, followed by a soft comfort pad, both of which are inserted by hand. The sole is then positioned against the upper, briefly joined at the toe and heel by “spotting” - wherein a hot blade is put between the welt and the sole to join them together. 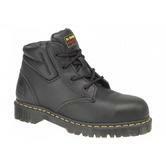 Our range of Docs is made from the best quality, premium strong leather - the quality is noticeable. 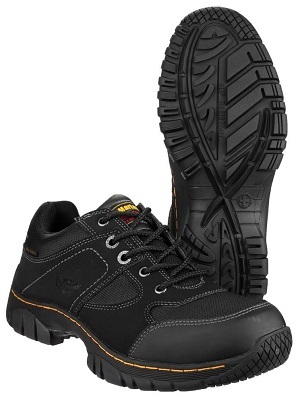 Not only do we sell mens safety work boots but we also sell non-safety Dr Martens, the classic, casual Docs, like the 14 eyelet Dr Martens black boot, or the more modest, 3 eyelet black or cherry red leather Dr Martens z welt shoe and the Dr Martens Black pull on dealer boot. 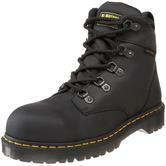 Dr. Martens Safety Boots, the original work boot icon, since April 1st, 1960. Check out these popular styles: the Dr Martens Icon 7B10 black safety boot and Dr Martens Rosa ladies safety rigger boot, with fur lining. 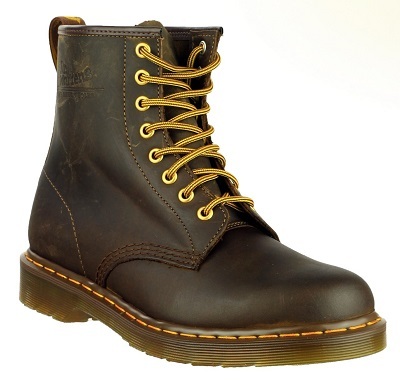 Dr Martens UK: Good prices, iconic product and quick delivery (same day despatch! ).